Unicorns are all the rage! From Starbucks drinks to whimsical cakes, unicorns are making an appearance on everything these days. 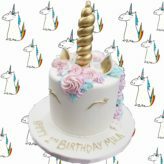 We at The Baking Institute have been super busy churning out unicorn themed cakes and confections on a on a regular basis for our customers. As always, no idea or theme is impossible for us … Continue reading Unicorns Everywhere!